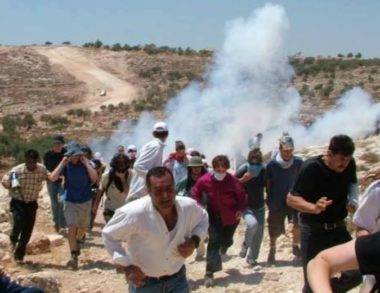 Israeli forces suppressed the weekly non-violent protest in Ni’lin village in the central West Bank, resulting in dozens of Palestinian protesters suffering the effects of tear-gas, according to local sources. Protesters waved the Palestinian flag, and shouted slogans rejecting Israel’s policy of administrative detention, in which accused Palestinians are detained without charge, and denied a trial. Locals told Ma’an News Agency that the peaceful demonstration faced Israeli tear-gas bombs and stun grenades, in an attempt by Israeli military forces to shut down the solidarity march. Palestinians in Ni’lin, west of the city of Ramallah in the occupied West Bank, marched in solidarity with Palestinian prisoners held in Israeli jails, and to protest the extension of the administrative detention of 2 Palestinian activists: Thaer Amira, and Salah al-Tayeh.